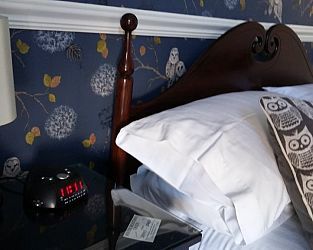 Maison Dieu Guest House, comfortable and welcoming AA 4 Star Guest House located in the centre of Dover Kent, free parking, WiFi, early Lugggage drop, maps and information, all to ensure the very best is made of your stay. Visit Dover Kent and the surrounding villages and stay in bed breakfast, hotel or self-catering accommodation provided by BedPosts members. The town of Dover in Kent is a major ferry port conveying passengers and their vehicles to Calais in France accross the Straits of Dover, the narrowest part of the English Channel. The town's name derives from the River Dour. Archaeologists have proved that this place has been inhabited since the Stone Age. Visit the "White Cliffs of Dover" immortalised in the song by Vera Lynn beginning at the National Trusts's Gateway; South Foreland Lighthouse built in 1843; Dover Castle founded 1168; the Wartime Tunnels; Dover Museum; and Roman Painted House. If you seek accommodation near Dover in Kent you have come to the website of a “club” of providers who offer affordable quality accommodation around UK in hotels, bed and breakfasts, guesthouses, inns, and restaurants plus self-catering cottages and apartments .